Is coaching really worth your time, energy and effort, not to mention the financial investment? Yes! Coaching is worth every aspect of your investment! It’s easy to measure results financially and statistically, but what about some of the other not so obvious benefits like, easier/faster restorative procedures, improved teamwork, increased self-confidence and job satisfaction? Be sure to celebrate these wins with your team every chance you get! Recently I had a chance to do just that! I helped Scott White and his team celebrate their wins! 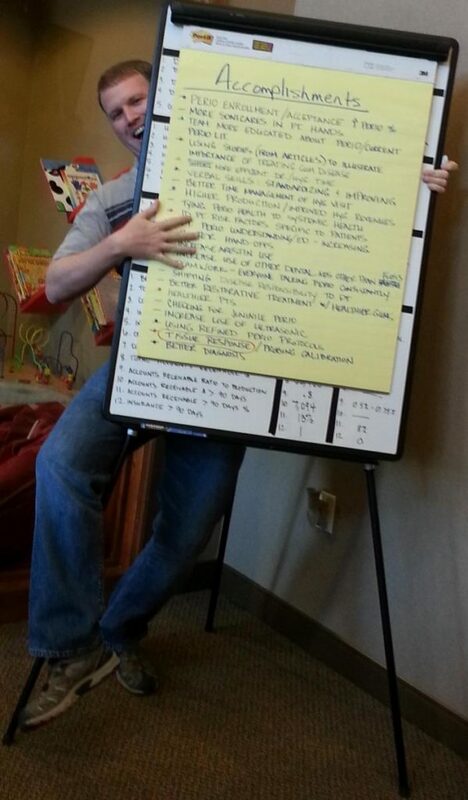 I think you’ll agree he looks pretty happy as he hugs the list of accomplishments he and his team proudly displayed during their recent coaching session. As graduates of our Maximum Growth Program, this team not only met their goals,goals, they exceeded them. And as you can see in the group photo, they were all very excited about their success. Judging by their excitement and determination, there will be no stopping them as they charge into 2014. But don’t take it from me. The proof is in the pictures, in their stats (below) and in the attached short video clip. Please take a few minutes to watch Dr. White’s testimony where he shares how ‘his perio program’ has given him a surprising advantage as he meets the restorative needs of his patients! Hygiene Hero or Visit Villain? Thinking like a hero, regarding our patient’s oral health, is much like how we teach our children the importance of good study habits. If your teenager is struggling with a class, we as parents don’t just say “try a little harder” nor do we do their homework for them. Instead, we use every resource available to help them succeed. We help them study, we talk with the teacher or maybe get a tutor, spending more time and money if necessary. Keep the patient involved and informed of their disease level at each and every visit. Give encouragement with what that they are doing well, but never be afraid to recommend the proper treatment and services that are needed. Remember, YOU ARE A HYGIENE HERO BECAUSE YOU HAVE THE SOLUTIONS!